BEIJING: Hong Kong's Mass Transit Railway (MTR) rail operator is planning to join hands with a Chinese rail giant to bid for the Kuala Lumpur-Singapore High Speed Rail (HSR) project, a top official has told the South China Morning Post (SCMP). Mr Frederick Ma Si Hang told SCMP that the company was interested in partnering China Railway Corp to bid for a contract to build the 350km high-speed rail link in South-east Asia. The SCMP, in its exclusive report yesterday, said the planned joint bid would be MTR Corp's first investment under China's "Belt and Road" plan. The Kuala Lumpur-Singapore HSR project is slated to be completed by end-2026, and will cut travel time between the two cities to 90 minutes. It will go across the Strait of Johor via a 25m-high bridge near the Second Link and will have eight stations along the line. 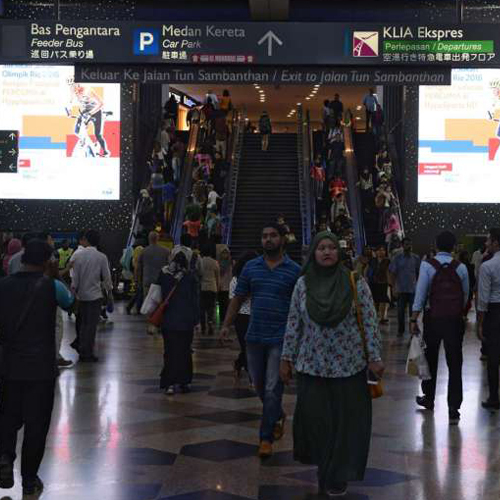 Japan, South Korea, France and the United States are among other countries keen to bid for the rail project, estimated to cost RM60 billion (S$19.4 billion). Mr Ma was part of a 30-strong delegation from Hong Kong led by the city's Chief Executive Leung Chun Ying at the two-day Belt and Road Forum in Beijing. "We want to expand into new markets under the 'Belt and Road' initiative,"
"But we are careful in considering factors such as financial viability of projects and risks." SCMP reported that Mr Ma learnt from Malaysia's Transport Minister Liow Tiong Lai at the forum on Sunday that the tender for the rail project was due at the end of this year. Mr Ma said MTR Corp and China Railway Corp signed a memorandum of understanding for any cooperation in the "Belt and Road" initiative last December, paving the way for future partnership in more than 60 countries along the overland and maritime trade corridors. Mr Ma said there are many highly populated markets along the trade corridors. He added that risks involved in politics, financing and corruption had to be mitigated. "The financing issue can be resolved through AIIB," Mr Ma said, referring to the Asian Infrastructure Investment Bank. The China-backed bank was started in 2015 to help finance the building of infrastructure in the economies along the trade routes. MTR Corp's reach extends to Beijing, London, Australia and Sweden, mostly in managing rail lines. Last November, it opened Hong Kong's first institution for railway engineers. An express rail link connecting the city to the mainland's national high-speed network is also scheduled to open next year.